Ivan Bogoev of Campbell Scientific, Inc., and Alex Thomas and Dave Price of Campbell Scientific Australia test the CO2 sampling system at OzFace. 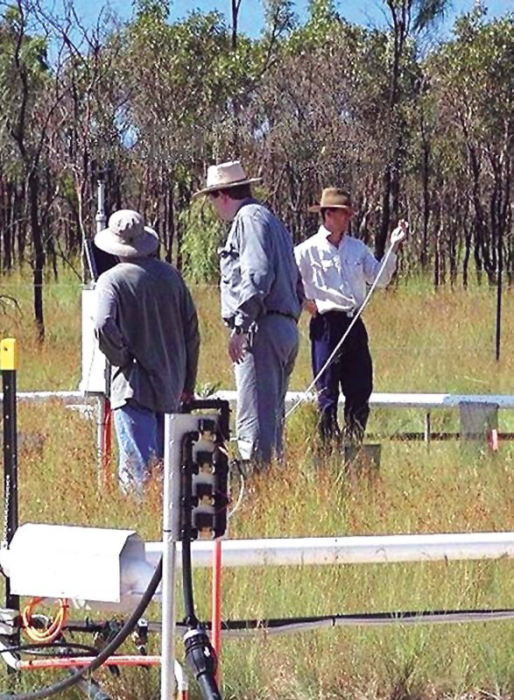 An experimental facility (OzFace) has been established in Townsville, Australia to examine the impacts of elevated carbon dioxide and climate change on tropical savannas. While there are several other Free-Air Carbon dioxide Enrichment (FACE) systems throughout the world, the OzFace system is the first in Australia and the first in the world conducted in the tropical savannas. The OzFace system, designed and constructed by Campbell Scientific Australia, is a collaborative venture between Queensland Nickel Pty Ltd, James Cook University of North Queensland, and CSIRO. The primary objective is to study the effects of controlled, elevated levels of CO2 on an ecosystem under natural conditions. While this sounds simple, it requires a sophisticated system to provide accurate measurement and control of CO2 under varying wind speed and direction. In June of 2000, Campbell Scientific Australia (CSA) was awarded the contract to design, construct, and commission the OzFace system. With an on-site supply of CO2 and three hectares of land provided by Queensland Nickel, construction commenced in October 2000. Dr. Andrew Ash and Mike Whiting of CSIRO Sustainable Ecosystems and Dr. Joe Holtum of JCUNQ provided invaluable design assistance to CSA during the design phase of OzFace. Campbell Scientific, Inc., in particular Ivan Bogoev, played a pivotal role in designing the CO2 delivery system and in the design and manufacture of a spatial sampling system to measure variability of CO2 across experimental plots. The OzFace system has six identical experimental rings. These octagonal-shaped rings have a 15 meter diameter with each octagonal segment consisting of a PVC pipe that is sealed at one end with an air blower attached to the other. Based on wind speed, an independent set of four solenoid valves controls the CO2 delivery rate. Two solenoid valves on each PVC segment control CO2 supply based on wind direction. The blower forces the CO2 and ambient air to mix inside each segment before exiting through numerous 10 mm diameter holes along its length. The vegetation inside each ring is subjected to varied CO2 levels: two rings at 370 ppm (ambient CO2), two rings at 460 ppm, and two rings at 550 ppm. To achieve the target CO2 concentrations, the amount of CO2 released through each segment is controlled according to the wind direction and velocity. CO2 usage for the site is approximately 1.5 tonnes per day. Within each experimental ring, multiple treatments simulate varying grazing and fertiliser effects. Soil moisture, plant biomass, plant carbon, and soil carbon are all independently measured to study the effects of increased CO2 levels. Logistically, construction of the OzFace project presented many challenges. Over 600 meters of trenching contained several kilometres of AC cables, instrumentation cables, and over a kilometre of CO2-supply pipe. Six control boxes, 48 AC-powered air blowers, and 80 solenoids were networked together. To further complicate the process, construction was conducted in the middle of a typical monsoonal wet season. Commissioned in March 2001, OzFace has a projected operational lifespan of five years. After six months of troublefree operation and performance, the OzFace installation stands a proud testament to the quality of Campbell Scientific equipment and the capability of its staff. Six CR10X dataloggers measure and control the six experimental rings. The dataloggers are networked via an MD9 coaxial network to a central control computer housed in an air-conditioned office on site. A GSM cellphone connected to the computer running pcAnywhere allows off-site control of the entire system and remote data collection. The CR10X dataloggers measure wind speed and direction at each ring to ascertain the amount of CO2 delivered. An SDM-CD16AC control port module at each ring switches a combination of 20 solenoids according to the wind measurements. Each datalogger program waits an appropriate interval for the released CO2 to reach the sampling location, and measures the CO2 concentration via a Li-Cor GasHound CO2 Analyser before recommencing the measurement and control cycle. A sophisticated PID measurement and control program within each datalogger provides automatic control of the entire system. PC208W software allows automatic data collection and storage on the central computer.